It is that time of year again. The council is advertising the fact we have blue flag beaches again this year in the article here on their website. Our water supply was not working forst thing this morning. It is now back on but the pressure is very low. So there is just a trickle coming out of the taps. Hopefully this will be resolved soon. I am not sure how widespread this problem is in Almerimar. Maybe it is confined to the Calle Alcor area of town? I just spotted the article here on the Voz de Almería site. It says that the opposition party in the El Ejido/Almerimar council is pushing the idea of having a more permanent outdoor stage/theatre venue in Almerimar. Thanks to Karen D for providing me with some photos of the jellyfish that were spotted on the beach at Almerimar yesterday. Earlier today I was out and about in the area of the 3 Darsenas. The photo above is work taking place on Darsena 1 not far from the El Tunel bar/restaurant. It looks like the walls of all the apartments are being repaired and painted. Read More to see some more photos of changes taking place around the marina. I bumped into Christina G this morning who mentioned that people have been asking why the property tax paid to the local council is less this year. The answer is that it is not less. It is just that the council is taking the payment by direct debit in two stages this year. Please see the article here for a bit more detail. 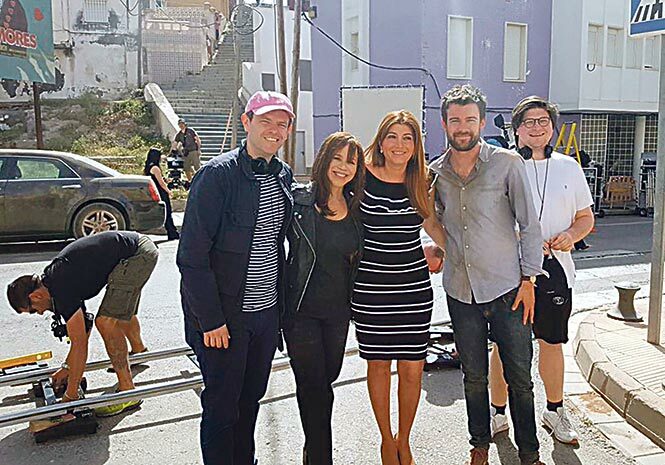 The Sol Times site has a story here about the UK TV series Bounty Hunters being shot in Almería for the next 3 weeks. "Detached tentacles and dead specimens (including those that wash up on shore) can sting just as painfully as the live organism in the water and may remain potent for hours or even days after the death of the organism or the detachment of the tentacle." I found the photo below of a live one from the National Geographic website. It looks similar. So in the words of Hill Street Blues "Let's be careful out there". For the last few weeks we seem to be having lots of short glitches in the electricity supply. Some are a few seconds long. Others are so short the clocks on the oven and microwave do not even reset themselves. We have a combined light and fan in the living room. We leave this switched on at the light switch but switched off via a remote control. When the power glitches the light switches itself on. This is a bit on a nuisance, particularly at night. Look at the sand in Almerimar. Sadly, I am not writing about the beaches. The three photos above show sand in Almerimar in different ways. The top two pictures were taken this morning. After rainstorms yesterday. As you can see, the rain was carrying a lot of sand. The colour of our terrace wall and the floor are normally pretty much the same. The second photo shows how much sand landed on our car when we were driving it in a rainstorm yesterday afternoon. The third picture was taken before the rain started last night. It shows how much sand has been put on the 5th green on the Master course after the green was hollow tined. My guess is that quite a bit of the sand on the green might have been washed away by the rain last night. One other point to note is that the Master course is expected to open again on Monday 7 May 2018 all being well. This coming Monday, 23 April 2018, is the local bank holiday for San Marcos. There are signs at the checkout saying that Mercadona will be closed that day. I guess people can expect other local businesses to be closed on that day as well. I understand that the Junta Local (like a parish council) for Almerimar is getting in touch with the presidents of all urbanisations in the area. I believe that they are going to try to set up a meeting to discuss action to be taken to control the level of mossies in town. I guess this can only be good news about how best to deal with this issue. Got this from the Almerimar Junta Local Facebook page. Watch out for roadworks in the lakes area tomorrow. I had to pop down to see Sharon at Alcor Properties yesterday. While there I took a few pictures of changes in "The Square". The grass is being reseeded, Fosil has a new outdoor space and La Cala is now open where La Gaviota used to be. Those people who pay their property tax to El Ejido council by direct debit will probably have received a letter similar to the one above recently. I have OCRed the letter and put the results through Google translate. Basically, it says that they will introduction the option to take their payments in 2 parts this year rather than as a single payment. Read More for a Google translation of the letter. UPDATED - Almerimar not likely to be on A Place In The Sun before spring 2018?